Study after study has found that the current practice of healthcare falls far short of quality benchmarks. The cost of failing to meet these benchmarks is enormous, whether calculated in terms of unnecessary mortality (death), unnecessary morbidity (illness), reduction in health-related quality of life, or economic costs (Matchar and Samsa, 1999). The legal system adds to the financial consequences of errors through settlements, jury verdicts and litigation fees. Just one type of error, medication errors, has been reported to affect about 2 million hospital patients a year, with some research indicating that nearly 30 percent of mistakes are preventable. Other researchers estimate that 3 million such mistakes occur every year. It is estimated that 20 to 35 percent of the healthcare organization’s bottom line goes directly to rework and/or is lost in error (Pinkerton, 1999). Two large studies of adverse events took place in the early 1990’s, one conducted in Colorado and Utah and the other in New York. The studies found that adverse events occurred in 2.9 percent and 3.7 percent of hospitalizations, respectively. In Colorado and Utah hospitals, 8 percent of adverse events led to death as compared with 13.6 percent in New York hospitals. In both of these studies, over half of these adverse events resulted from preventable medical errors. When these statistics are extrapolated to the over 33.6 million admissions to United States hospitals in 1997, the results of the study in Colorado and Utah imply that at least 44,000 Americans die each year as a result of medical errors. Using the New York study data suggests that the number may be 98,000 (Kohn, Corrigan and Donaldson, 1999). Dr. Lucian Leape, one of the principle investigators in the New York study, believes that as many as 120,000 Americans die each year from hospital errors. Establish a national focus to create leadership, research, tools and protocols to enhance the knowledge base about safety. Identify and learn from errors through the immediate and strong mandatory reporting efforts, as well as the encouragement of voluntary efforts, both with the aim of making sure the system continues to be made safer for patients. Raise standards and expectations for improvements in safety through the actions of oversight organizations, group purchasers, and professional groups. Create safety systems inside health care organizations through the implementation of safe practices at the delivery level. This level is the ultimate target of all the recommendations (Kohn, Corrigan and Donaldson, 1999, p. 5). Create a National Center for Patient Safety that would set national safety goals, track programs, fund research on error rates, and prevention strategies, and serve as a clearinghouse of educational information and best practices. Peer review protections should be extended to cover voluntary reporting of near misses or errors that do not have serious consequences. Groups that license and certify physicians and other health care providers should implement periodic reexaminations to document both practitioners’ competence and knowledge of safety practices. Other regulators should make patient safety a key component of evaluations. 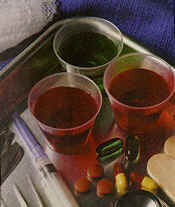 Hospitals and other healthcare organizations should implement established medication safety practices and other methods known to reduce errors (Prager, 1999). The Institute of Medicine report concluded that errors in medicine occurred within the complex system of healthcare. Complex problems demand multiple, multifaceted solutions. There is a lot to be done to make the healthcare system safer. This study can be downloaded or ordered as a book from www.nap.edu. It is essential reading for trial attorneys handling medical malpractice cases. Specialized training for pharmacy staff who prepare pediatric intravenous solutions was dangerously inconsistent. Only half of the respondents reported that the patient’s weight was always entered into the computer before processing orders to allow the system to warn practitioners about drug doses that exceed safe limits. Three-quarters of all respondents said that prescribers inconsistently or never list the mg/kg dose with pediatric drug orders. Only half of the neonatal intensive care unit or pediatric intensive care unit respondents reported that pharmacists always verify the mg/kg dose and recalculate the specific patient dose before dispensing pediatric drug orders, regardless of the setting of case. Only 80 percent of the general pediatric unit respondents reported always entering a patient’s age before processing a drug order (Kohn, Corrigan and Donaldson, 1999, p. 5). It is clear that these problems reflect flaws in the healthcare system that allow dangerous practices to exist. Recognition of a problem, without resultant efforts to make the system safer, increases the facility’s liability. Kohn, L., Corrigan, J., Donaldson, M. (Eds.) (1999). To Err is Human: Building a Safer Health System. Institute of Medicine. Washington DC: National Academy Press. Matchar, D. and Samsa, G. (1999, October). The role of evidence reports in evidence-based medicine: a mechanism for linking scientific evidence and practice improvement. The Journal of Healthcare Quality: The Joint Commission Journal, 522. Pinkerton, S. (1999, July-August). Best nursing practices and best hospitals. Journal of Professional Nursing, 15 (4), 207. Prager, L. (99/12/20). Report unleashes furious interest in medical errors. American Medical News.